Monteagle Mountain is a steep mountain grade located in the Appalachian Mountains of Tennessee on Interstate 24, approximately 75 miles east of Nashville, Tennessee. Interstate 24 is part of the main route connecting Nashville, Tennessee and Atlanta, Georgia. Interstate 24, at this location, consist of an east and west summit separated by approximately two and a half miles of rolling hills with a steep descent from both summits. 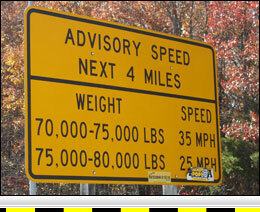 Westbound Interstate 24 from the Monteagle Summit has a vertical descent of 778 ft. over 4 miles. The reported grade for the westbound descent is 5% for 4 1/2 miles. About half way down this grade there is a right advisory curve. The median barrier at the curve has a significant amount of damage showing many vehicles have had trouble here. Eastbound Interstate 24 at Monteagle Summit has a mandatory truck inspection area where signs containing information about the grade are displayed. After stopping at the mandatory truck inspection area, trucks must then weigh at a traffic metering signal before re-entering Interstate 24. 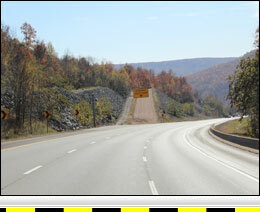 Interstate 24 from the eastbound Monteagle Summit has a vertical descent of 1,161 ft. over a distance of 4.1 miles. The reported grade for the eastbound descent is 6% for 4 1/2 miles. The eastbound descent has runaway truck ramps at both 1.9 miles and 3 miles from the summit. 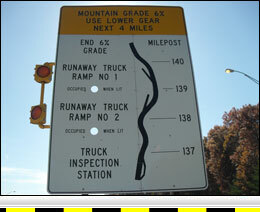 Both runaway truck ramps are on the left side of the road, so trucks using the runaway ramps must cross two eastbound lanes of traffic to do so.